if you arrive early and its a beautiful day you can sit in Garden area! Otherwise come to office 224, door straight ahead and wait in first room.I may still be with someone so please start relaxing. NUAD BO RARN (ANCIENT MASSAGE) practiced at the OLD MEDICINE HOSPITAL IN CHIANG MAI WILL BE AVAILABLE SOON. Thai massage is practiced on the floor on a mat, however I will also be offering Table Thai. 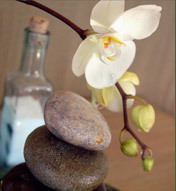 Read more on the Thai Massage page of this website. You will love Thai Massage. Sick? Some things in this link you may want to read. Note: Please Text if you need to cancel or change appointment or are lost, due to the nature of my work Texting or Email is best. Online Scheduling through Genbook...Click Below! It does not ask for credit card information. If you do not see a time you want please text me ...I will always try and do my best to be flexible...Closed business hours do not mean I am not working...after booking online...a confirmation email will be sent to you 24 hrs before your appointment. You will also be able to cancel your appointment online at anytime. Note: If you do not receive "booked email" when you book online your appointment was not scheduled. Either pick an earlier time or contact me. If you need to cancel go to end on confirmation email. If you don't cancel 24 hours before your appointment or no show for you appointment, you will be sent a $25 PayPal e-invoice. Payments now available online before your appointment or at my office through PayPal. No account with PayPal needed. Just click "pay with debit or credit"just below paypal login to process without setting up account. Easy! Secure! Safe!